The testing of my 6 meter loop antenna continues with my Rig Expert antenna analyzer connected up to the antenna in this photo. The preferred way of orienting the loop is off of the back of the vehicle (more apparent when standing behind my mobile), as it rides better moving down the road, but more importantly the RF network when analyzed on the smith chart of the antenna analyzer shows better readings, as the antenna is not interacting with the vehicle near as much as when it is oriented 180 degrees to the front of my mobile. 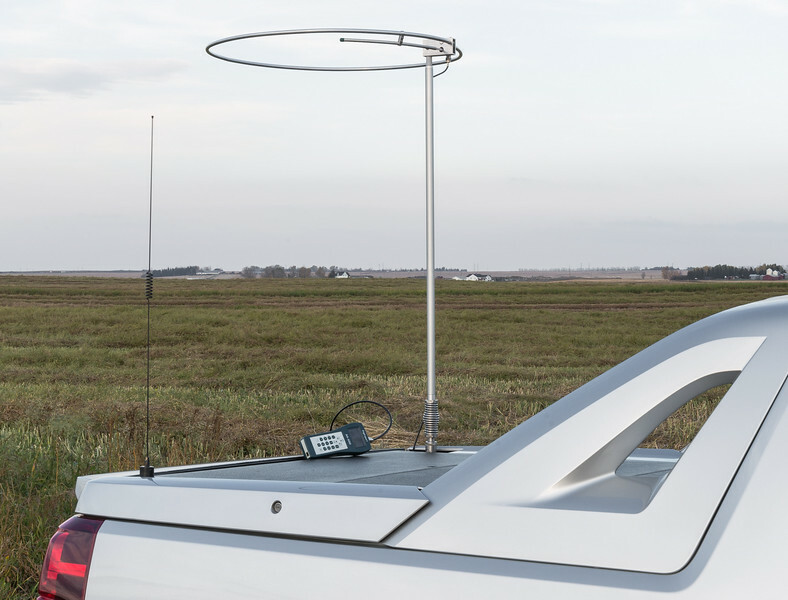 This is to be expected, as the 6 meter loop is a complete dipole antenna not requiring the vehicle as part of the equation, unlike the normal HF mobile vertical antennas that are half of a dipole antenna, the other half being the vehicle. Of course it goes without saying that the antenna would do better mounted higher, but my intent was to have a 6 meter horizontally polarized loop antenna capable of going down the road, and I've accomplished that. Now if I am operating from a stationary position, I can utilize a longer mast assembly to get the antenna higher in the air, or if I have my Max Gains systems push up mast mounted on my mobile, with my inverted loop in place at the top of the mast, I have built an offset mount that allows for the 6 meter loop to be positioned 15-20 feet or so off of the ground.....it's called "Options"
Also of note, is the new mast assembly that I built from 1" anodized aluminum tubing with high-tensile aluminum 3/8 X 24tpi inserts on either end. The mast also includes a run of coax through the center, and exiting at the top and bottom of the mast. The short length of coax was run through the mast before having PL259 UHF connecters crimped and soldered in place, making this short length of coax a permanent part of the mast. Another plus to the mounting arrangement as seen here, is the fact that if I am not paying attention to garage door openings or low lying tree branches and what not, the mast with the CAL-AV spring at the base will take the hit without any damage occurring to the antenna assembly or to the loop for the most part.